Liz Valashinas once made a custom pair of jeans for a Sumo wrestler — quite possibly the biggest challenge she’s faced in her line of work. 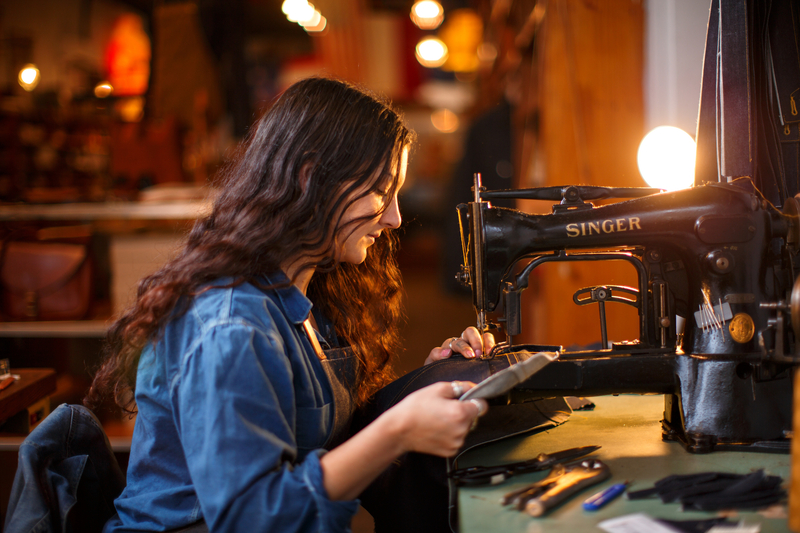 And that’s saying something, because at just 25, Liz is already a Greensboro entrepreneur, a tailor, a designer and the founder and owner of Mary James & Co., a new denim clothing line. 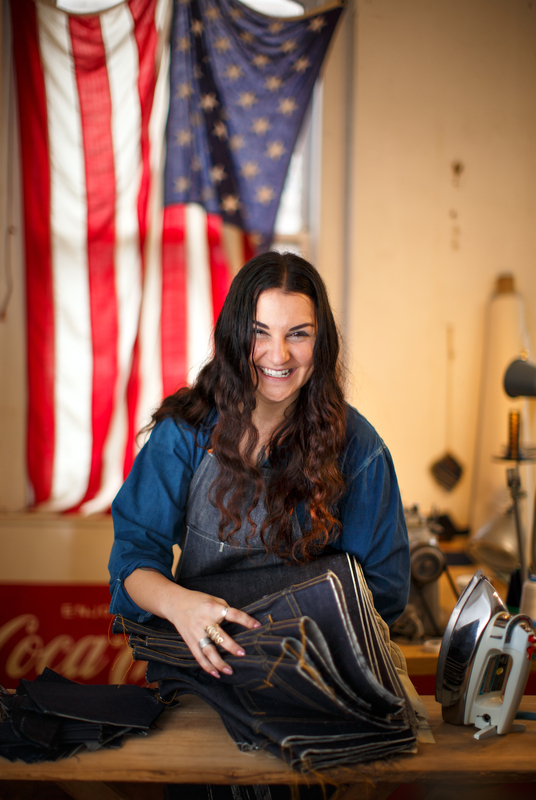 Liz learned to craft jeans when she worked as a tailor for Levi’s Tailor Shop, the iconic brand’s store in San Francisco where they provide alterations, hemming and repairs, and create one-of-a-kind pieces. Liz decided to move to Greensboro and start Mary James & Co. after meeting Evan Morrison, part-owner of the local clothing retailer Hudson’s Hill. They met through mutual friends at San Francisco’s Denim Bruin event, a gathering place for denim “heads” to attend workshops and view curated collections. Liz and Evan connected over their passion for everything denim. “I was inspired by everything we talked about and how we feel about our garments, how we treat them and live in them daily,” Liz says. Denim manufacturing played a key role in the Greensboro’s history, with the former Cone Mills once being the largest denim producer in the world. So it’s fitting that Liz has named her new denim line in honor of Greensboro: GSO-1 for Hudson’s Hill. “Denim in America started here, and I wanted to relate that back to the brand and back to the basics,” says Liz. Her new line defies modern fashion trends in that it is a unisex jean, all cotton with five pockets and a buttoned fly. The material is mid-weight denim that moves with you, offering more comfort and breathability. They’re practical, too. The jeans are lined with a type of weave found in lots of military garments once made in Greensboro. It’s extremely durable and if the fibers are broken, they rip along a grid that makes it easy to repair. The jeans are Cone Mills White Oak denim, and the front panel is made from Ripstop cotton fabric. 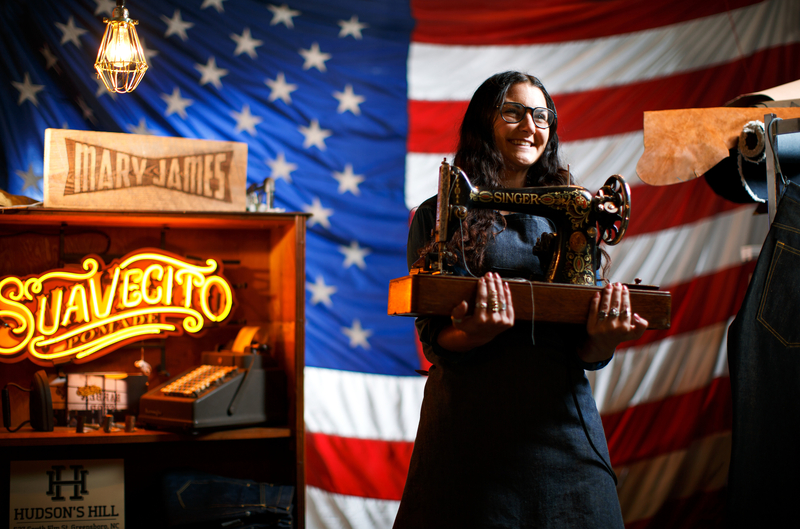 Liz makes the garments on vintage machinery with American-made textiles and hardware. She prefers to use antique sewing machines because it gives her more control of the fabric and construction. It also gives the stitching a unique look. It takes anywhere 16 to 20 hours to make each piece. Not to mention, “It’s the least carbon-footprint denim ever made,” Liz says. The denim is made locally at International Textile Group, formerly Cone Mills. The leather is laser engraved at Mischief Makers. The jeans are tailored on South Elm Street at Hudson’s Hill. “It’s meant to be worn in Greensboro and appreciated here,” Liz says.